Ask C-suite executives to identify the pillars of safety, and their responses likely will include training, risk management, PPE, monitoring, root cause analysis, and culture. While all these relate to safety, they are in fact safety tactics and policies rather than the support structures that truly promote a safe workplace. 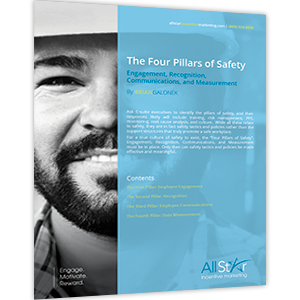 For a true culture of safety to exist, the “Four Pillars of Safety”: Engagement, Recognition, Communications, and Measurement must be in place. Only then can safety tactics and policies be made effective and meaningful.